Easy Norwegian Waffles are sweet, crisp, and perfectly delicious. These heart shaped waffles are an amazing breakfast or dessert. 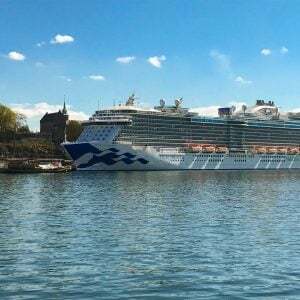 I recently took a trip of a lifetime onboard the Regal Princess, cruising my way around Scandinavia. 11 days cruising around the Baltic Sea is something that should be on everyone’s bucket list. The trip had an absolutely amazing itinerary! We departed from Copenhagen, Denmark and sailed to Oslo, Norway. Norway was one of my favorite stops on the trip. We arrived on a National Holiday so things were a bit more quiet than usual, but my husband and I still had an amazing experience. Our ship was docked right downtown with the most picturesque views of the fjord on one side of the ship, and an amazing fortress on the other. It was an absolute breathtaking w ay to start the day. We explored a bit on our own, but we also did an excursion through the ship. 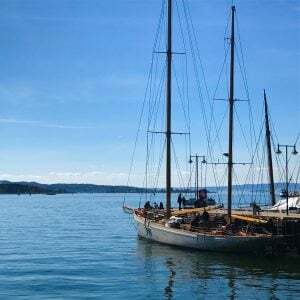 We went on a bike tour of the city and, wow, what a great way to see Oslo! Highlights included the royal palace as well as the sculpture park. After our bike ride we went out in search of the most authentic Norwegian dinner we could find. We found it at Nilsen Spiceri. It was an AMAZING meal and it ended with a classic Norwegian dessert that blew my mind: waffles. In Norway waffles are served as a dessert and are topped with sour cream, lingonberry jam, and brown cheese.Our tour guide had mentioned that we needed to find some brown cheese and try it, especially on waffles. Now, what is brown cheese? The funny thing is, it isn’t even really cheese at all. It’s made from the liquid leftover after making goat’s cheese. It’s boiled down and caramelized and pressed into a loaf. And OH MY GOODNESS! It is incredible! If you ever have the chance to try it, you have to promise me you will! Today’s recipe is inspired by the waffles we ate at Nilsen’s. 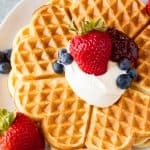 Now, you can’t easily find lingonberry jam and brown cheese here in the United States, but I wanted to recreate the amazing waffle base for you. I have to say, I did a pretty dang good job. These waffles are crisp on the outside, and have a sweet interior that will make you fall in love with waffles all over again. You definitely want to serve these up with sour cream and your favorite jam, as it is truly the best way to enjoy them. Syrup will drown out the flavor of the waffles here and you don’t want that. 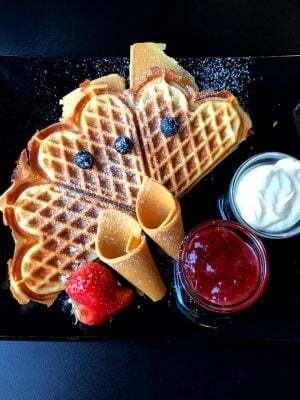 Norwegian waffles are traditionally made in a special heart shaped waffle iron. This recipe won’t produce great results in a Belgian waffle iron, so don’t try that. 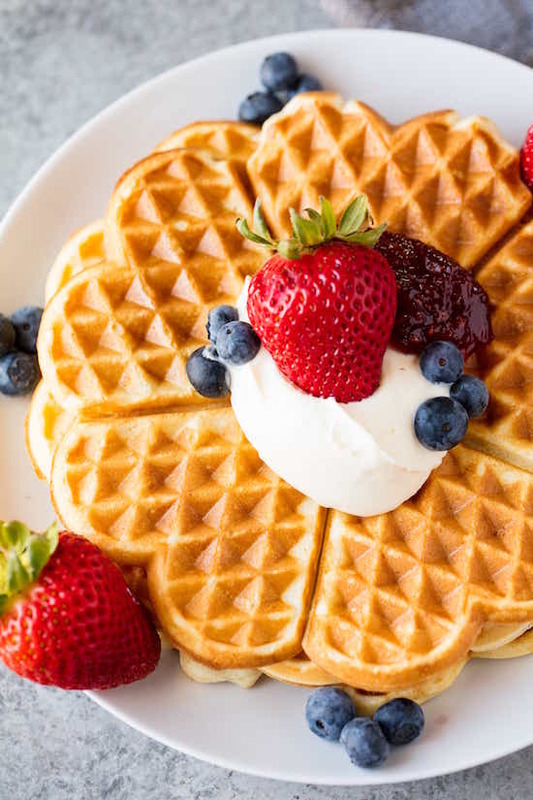 A regular waffle iron will be okay, but for best results, get yourself a heart shaped waffle iron and enjoy these, thin, crisp, sweet dessert waffles. Watch the video below where I walk you through every step of this recipe. Stay tuned at the end for some additional picture from our time in Norway. Be careful though, these pictures will make you want to go cruising around the Baltic Sea! In a large mixing bowl use a hand mixer to beat together eggs, sugar, and vanilla extract until creamy. Add in sour cream and melted butter and mix until the batter is smooth. Let rest 20 minutes before making waffles. Heat a heart shaped waffle iron and spray with nonstick cooking spray or brush with melted butter. Pour 1/4 cup of the batter onto the waffle iron, close, and cook until light brown. Serve with whipped cream, creme fraiche or sour cream. Traditional toppings include lingonberry jam, brown cheese, sour cream, and berries. I will be making a ton of these for a Scandinavian Dance Workshop this weekend. For those of us not near an IKEA Gjetost (Brown Cheese) and Lingonberries can be ordered online thru Ingelbretsens.com . I stumbled upon your recipe, and i just wanted to say that the recipe is very nice, very close to original. I’m a Norwegian, and for me, Lingonberry is not something i use. Me and my family use strawberry jam, sour cream, butter, Brown cheese. Or different berries depending on season. There are also regional waffle recipes, some are like biscuits, but still made in heartshape iron. An oddity is the wiener hot dog served in a waffle, with ketchup and mustard:-) thank you so much for a nice story! The best! No need to alter recipe at all! I’ve had a lot of waffles before and yet, I haven’t had these ones. Even though they take longer than normal ones, I wouldn’t mind spending some extra time making these. I’m sure that I’d be able to handle making these as the instructions you laid out are pretty straightforward. I just Got back from Norway and loved these. Do you think I could Use a Pizelle maker? The whole thing that makes these so special and so good even cold is the sour cream and CARDAMON, half a teaspoon is all you need and perfection! These are the best waffles ever. They replaced all of our other recipes! I love this recipe and it tastes delicious! Cardamom is a key ingredient to give these waffles the right flavor. Cardamom is definitely a popular ingredient in Scandinavia. We didn’t have any Norwegian waffles during our time there that contained cardamom though. Definitely sounds good though!